You are in a room that has a mirror as one of its walls. You assert/commit to that you are conscious and have qualia. You look at the mirror, and you observe your own image. The person in the mirror looks and behaves like a conscious, qualia possessing human: you. You assert that mirror images cannot be conscious. Therefore, the mirror image of you is an example of a human that looks and behaves identically to a conscious human, but is not conscious: it is a philosophical zombie. What are the weaknesses of this argument? This illustrates how removed the concept of 'philosophical zombie' is from reality. The mirror image does not have a brain; it is a trick of light. It is no more a 'zombie' than a photo, a drawing, or a terse sentence in a bad novel. More specifically; the concept of a philosophical zombie is that there can exist something in principle indistinguishable from a human, that does not possess consciousness. A mirror image can be distinguished from a human by a number of means, and hence it doesn't even qualify as a philosophical zombie. No questions of dualism arise from this. Approach 1 - (4) is false. One line of reasoning has already been presented. (4). The person in the mirror looks and behaves like a conscious, qualia possessing human: you. This is false, because the person in the mirror simply reflects the behavior of something else, which is not the behavior of a conscious human, but that of a reflection. Approach 2 - (5) is false. But there's a different way of approaching it. (2). You assert/commit to that you are conscious and have qualia. That's because the person in the mirror is you. (5). You assert that mirror images cannot be conscious. The mirror image is you, and you've already asserted that you are conscious, therefore it's illogical to assert that the mirror image isn't conscious. The difference between these approaches is simply in the delineation between "a thing" and "its reflection". Neither is more valid, and each is more useful in certain circumstances. If I walk up to a lake and look in, I see my reflection. But I say my reflection isn't me because if you punch my reflection, I just get a little wet, but otherwise feel no pain or discomfort. (We could do the same with a mirror, but I'd rather not take you to get stitches or clean up all that broken glass.) I also see that the reflection is distorted by the waves, your angle of viewing, etc., but yet doesn't appear to feel any of these things. In fact, the reflection doesn't seem to feel anything except the things I feel. If I sneeze, my reflection sneezes. If I laugh, so too does the reflection laugh. The reflection's actions are clearly caused by the stimulus acting on me, not it, while my actions are unaffected by any stimulus acting on the reflection. This tells me the reflection is not a part of me, and that it doesn't behave like a human. This time, let's say I'm standing near a dark curtain. I look past the end of the curtain and see a beautiful girl smiling at me. I wave at her, and she waves back. I write something on a dry erase board and she laughs. I write something else and she sticks her tongue out at me. She pulls out her own board and we start chatting back and forth. After several minutes of this, I conclude that she must be a conscious, intelligent person. Then the curtain is drawn back. Oh no! Turns out I was communicating with a reflection! This must mean the reflection is conscious, right? Well, no. What is really means is that I was mistaken about the exact physical form of the girl I was talking to (guess that cute little birthmark is on her left cheek, not the right), and her exact location. Because really, the signals from my brain were causing signals in her eyes via the mirror, and it was her brain that was processing those signals to communicate back to me via the same mirror. In this case, it could make sense to say the reflection is just part of the girl I was talking to. I wasn't talking to a reflection; I was talking to the girl herself. We can easily modify the thought experiment... take some robot duplicates a persons movements and speech. Is this robot a sufficient unity? The robot behaves as if it is conscious. There are two ways to deal with this. First, let's assume there's a robot in Ecuador while I'm in the United States. The robot duplicates all my movements, speech, and mannerisms as exactly as it can. In this case, we'd probably say the robot isn't conscious, and that it's not me. It's really just a (real-time) recording of me. If some giant alien spaceship starts doing stuff far above Earth, it's possible both me and my robot are looking at the spaceship at the same approximate angle, giving the impression the robot is actively perceiving things and reacting to them. But if a guy in Ecuador walked up to the robot, the robot would pay him no mind. It wouldn't react to being hit, beaten, stabbed, thrown off a cliff, etc. It would just keep attempting to play out the recording. This is clearly not a robot behaving like it's conscious. This starts like Example 3. We have a robot. But this time, the robot has some kind of high-speed connection to my brain; I'm plugged in like some kind of Matrix simulation. The guy in Ecuador walks up to my robot and says "Hi" (or "Hola" or whatever they say down there), and I say "Hi" back. We have a conversation. I react and interact with him. We could now say the robot is behaving like a conscious entity. But that's because at this exact moment, the robot is really just me in a new body. So it's not just behaving like it's conscious; it is conscious. This, again, comes down to a delineation between "robot" and "human" and whether we're separate entities. If you want to say we're distinct entities, then the robot isn't me, but it's not behaving like it's conscious either, because it's merely a reflection of me. Otherwise it's behaving like it's conscious, but only because it actually is conscious. There's no meaningful way to define this such that the robot is both behaving like it's conscious and not actually conscious at the same time. Of course, the guy in Ecuador might not realize that high-speed connection exists, and might then tell his friends "I met a conscious robot!!!!". From here we could say the robot seemingly behaves like it's conscious even though we know it's not conscious, but it's rather silly to jump from there to "p-zombie". Because we've arbitrarily defined the unconscious robot as the hunk of metal in Ecuador, while ignoring the all-important WiFi signal that's actually driving it. In this case, if our Ecuadorian friends brought the robot to Mars, they'd notice that it has a 40-minute lag time, and probably just shuts down completely, which would tell our Ecuadorian friends that something on Earth is controlling it. Your argument has a very straight forward resolution: statements 4 and 5 together are sufficient to prove that "the person in the mirror is a p-zombie." Those two statements form the definition of a p-zombie. That's the easy part. The hard part is your justification of those statements. In particular, how do you justify 5. If you assume it to be true axiomatically, as I just did, the logic is a piece of cake. However, if you feel obliged to defend that statement, how do you know that the person in the mirror is not conscious? We know that there actually is no "person in the mirror" from a scientific perspective, it's just a trick of photons, so when we say "the person in the mirror," we're clearly defining an entity which does not 100% supervene on scientific theory (we know this from statement 4: that it has qualia). Whether it is conscious may be a more complicated question than it appears at first sight. I think the really interesting question is to step back and ask "what is the person in the mirror, anyway?" I think that's where the real fun is. But what do you mean by the person in the mirror? Is there a person in the mirror? I think most people would disagree. You probably mean to say: "The image of the person in the mirror..."
Therefore, the mirror image of you is an example of a human that looks and behaves identically to a conscious human, but is not conscious. Again, is it legitimate to say that an image of a human is "an example of a human"? I think most people would disagree. 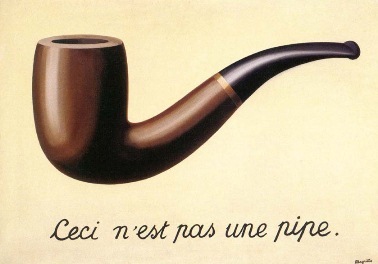 It is not a pipe, only an image of a pipe. Furthermore, when you look at a person, the photons arriving at your eye directly or through a mirror correspond to one and the same person. in both cases you just see an image a person. what bearing does the way by which the photons arrived at your eye have on the question of personhood, and consciousness except as a source of confusion? To conclude, there is no person in the mirror, and the image in the mirror is not an example of a human. I think it's a very good argument and shows that the philosophical zombie is a legitimate concept. (I have never understood arguments saying it isn't). So behaviorism alone as a test for consciousness (like the Turing test) doesn't make sense imo. Your argument reminds me of the Chinese room argument, in that we can get seemingly conscious behaviors out of non-conscious objects. I'm sure the same objections to the Chinese room argument (objections I don't agree with) would be made to your argument by functionalists. No. There is no "person in the mirror" only an image of a person reflected by the mirror. Grammar makes a big difference, no? The mistake is postulating entities "person in the mirror" and then pondering whether they may possess attributes like "consciousness". There is no person in the mirror; the mirror only folds the path of light so you can view objects from a different perspective. All that is literally in the mirror is a couple of millimeters of glass, a microns-thin reflective, metallic coating and backing paint to ensure opacity. The statement "people in the mirror aren't conscious" is meaningless nonsense. Not the answer you're looking for? Browse other questions tagged consciousness qualia zombies or ask your own question. What are the best arguments against substance dualism?